Pay-per-click (PPC) campaigns remain an important part of search marketing, although some would argue that in the history of web advertising, dedicated SEO is seen as offering a more innovative and creative route for businesses to generate traffic for a site and secure long term prosperity. This is a topic that was put to a number of experts interviewed by The Drum, to establish whether or not PPC’s reputation has altered in recent times and if there could be solutions that help to elevate its position and perception, to equal or exceed SEO. PPC, like other areas of search marketing, requires the guidance of an experienced hand if it is to be successful and profitable. But unlike SEO tactics, which optimise a site for achieving the best possible natural ranking, it is possible to feel the financial sting of a poorly organised PPC campaign in a much more immediate manner. Experts agree that PPC is seen as fundamentally less creative and flexible than SEO, as a result of the fact that it has to operate within the agenda of the firm behind the hosting of the adverts, which in most cases, is Google. In addition, there is the idea that earning a high organic search rank through SEO is a bigger achievement than buying your way to the top via PPC. 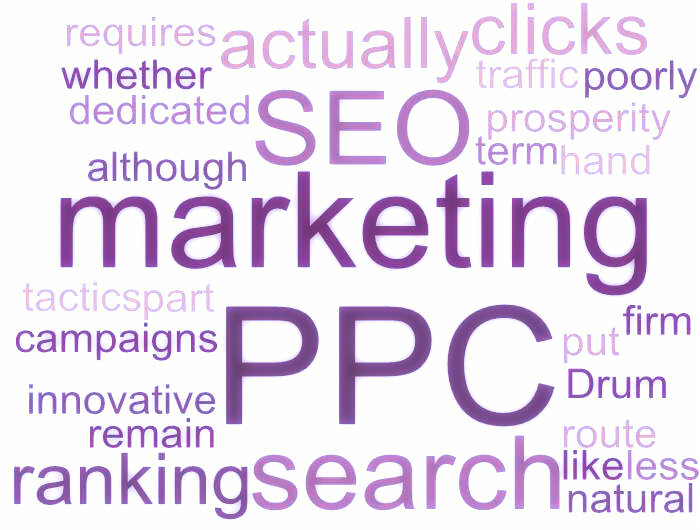 However, Carat’s Dan Robins said that there are ways in which PPC can offer a level of innovation comparative to that of SEO, since major search providers are constantly adding new ways for sites to pay for promotion and so there is a need for internet marketing agencies to stay on their toes and outfox the competition. Indeed some paid search studies actually end up having an impact on the wider market. In recent times, this has led to the discovery of the importance of search in a multichannel retail environment, according to Robbins. What some people often forget is that PPC needs to not only be about bidding on the right keywords to generate clicks that have the potential to turn into conversions, but also crafting landing pages and a site that customers will actually want to use. This means that there are core links between PPC and SEO which cannot be broken, requiring a holistic approach to optimisation that blends both earned and paid clicks, without necessarily privileging one over the other. PPC is actively becoming a more media-focused area of search marketing, driven by the growth of product and video listings as part of the services offered by the likes of Google. Rivals to this dominant force are also coming up with new innovations to entice marketers and also ramp up the creative potential. It is safe to assume that the shape of PPC will continue to shift, even if the importance of having the option to pay for promotion and not rely solely on organic ranking, remains a constant. Quite what shape it will eventually take is up for debate. This Article was Contributed to Ebuzznet by a Guest Author. You can also start Contributing on Our Site By Creating a Guest Account. Please Visit this Link for More Details.